Here's Every Hyperloop One Route Proposed For The U.S.
Hyperloop is still exactly what it was when Elon Musk revealed the concept several years back: an idea. But one of the main companies involved in making that idea reality—Hyperloop One—announced its vision for the U.S. and detailed 11 proposed routes on Wednesday. Founded in 2014, Hyperloop One is one of two companies trying to make a hyperloop system a reality. Last year, the company was ensnared in a heated lawsuit that was eventually settled. But in that time, the start up launched a competition for proposals from across the world to use the futuristic transportation system. See, it’s still only an idea—but it’s clearly fascinating many and even caught the attention of President Donald Trump earlier this year. Though it may be a long-shot, Hyperloop One seems dead serious about moving things forward. Here’s the 11 proposed U.S. routes that, in a futuristic world, could have you and I shooting through tubes to get around. Here’s one for New England: The Boston-Somerset-Fall River route, a 64 mile trek that, by plane, takes about a half hour to travel. Hyperloop One estimates it system could tackle that route in 7.5 minutes. A proposal from the rock Mountain Hyperloop Consortium would create a route that runs from Cheynne, Wyoming, to Houston—a whopping 1,152 miles. Estimated travel time? One hour 48 minutes. 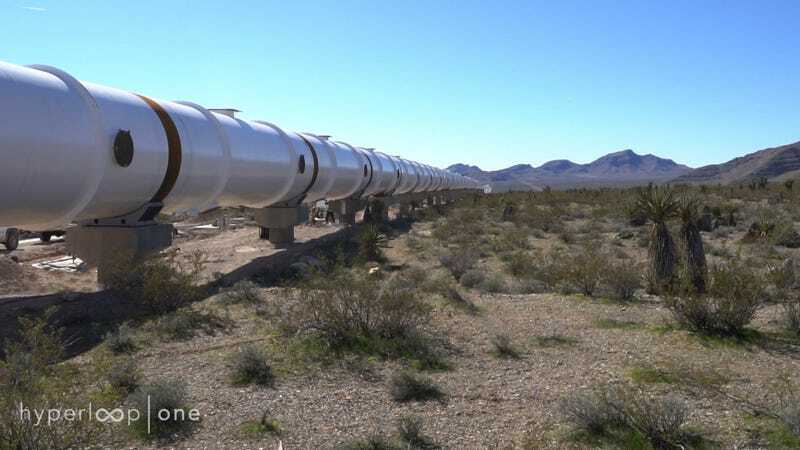 Hyperloop One also said this week that it completed tube installation at a 1,640-foot test track called the DevLoop in the Nevada desert. Shervin Pishevar, Hyperloop One’s executive chairman, speaks of the project as a revolution that’s quietly before us. The obvious caveat here is that, as we put it earlier this year, the start-up faces hurdles that stretch a mile-high. Any infrastructure project this size faces monumental regulatory clearances, irate lawmakers, land owners, and environmental approvals. Not to mention the sheer cost of such an enormous undertaking. Hyperloop One is planning to hold a public test later this year. The company says its goal is to have three systems up and running by 2021, an incredible pitch, but hey: dream away. The short trip times alone would be worth it, not to mention skipping the the crumbling infrastructure drivers face every day.